Argus Heating supplies IEC sockets and re-wireable plugs. Replacement plugs and sockets for the old style ‘sliding earth’ plugs and sockets used on band heaters. The older sliding earth plugs and sockets have been illegal to import (or sell) since 2005. We can typically upgrade band heaters wider than 50mm by removing the old sliding earth sockets and fitting new IEC sockets. 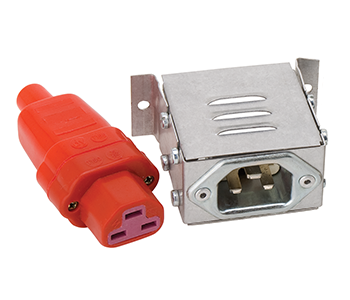 We can also supply re-wireable silicone plugs. International IEC and DIN specifications. Possible to retro-fit to existing band heaters. ‍Sockets are stainless steel with ceramic insulation. Plugs are silicone sheath cover over metal connectors. ‍Mica metal clad and ceramic insulated band heater power connections. IEC sockets and re-wireable plugs to replace the old style ‘sliding earth’ plugs and sockets used on band heaters. Band heaters wider than 50mm can be upgraded.